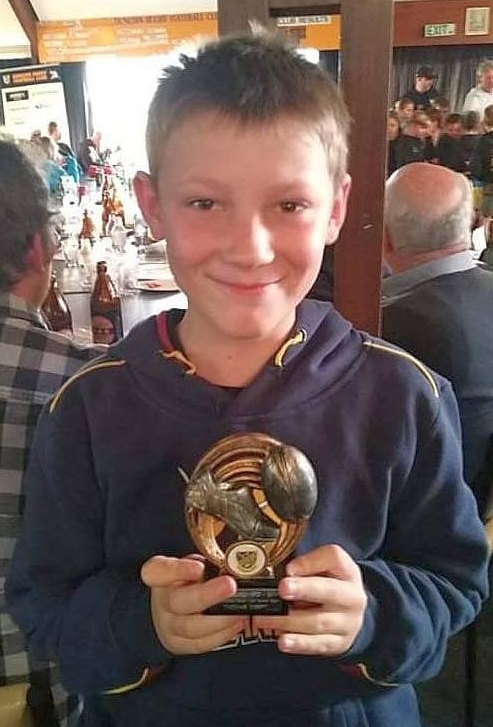 Thomas Kreft, a 10-year-old rugby fanatic from Ranfurly, has developed an interest in his ancestors. As he discovers more about them, he may well grow up to share some of their stoic, single-minded natures and their strong sense of solidarity. Thomas is a seventh-generation Kreft, a direct descendant of Johann and Barbara (née Kowalski) Kreft, who lived in Szczerbięcin, a village about 30 kilometres south of Gdańsk. Barbara gave birth to Thomas’s great, great, great, great-grandfather, Johann Martin, in 1847. Johann Martin grew up in an age where explorers had expanded the world’s boundaries to the Antipodes. Colonisers of the new south-Pacific lands looked for European settlers and mass emigration from Europe had started to extend farther than the original new worlds of the Americas. Shipping companies flourished as trade increased. Passengers and plant shared the same ships after officials realised that one would offset the cost of carrying the other. Competition flourished, fares decreased and came within the reach of the less wealthy. Aged 27, Johann Martin sailed to New Zealand on the three-masted square-rigged lammershagen with his wife, Rosalia, and their own two young sons, Johann and Joseph. 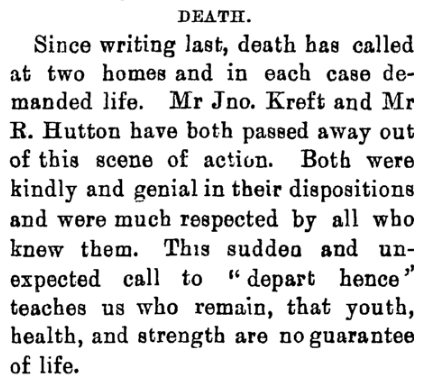 They left from Hamburg and disembarked in Wellington on 11 July 1875. Ethnic Kaszubian and Kocievian Poles living in Prussian-partitioned north-western Poland warmed to the possibility of starting new lives, owning some land and being free of political and religious persecution. Those who arrived in New Zealand in the 1870s and 1880s had never lived in a geographical Poland, which ceased to exist in 1795. Three political partitionings by its neighbours Prussia, Austro-Hungary and Russia during the previous 20 years had wiped Poland off maps. Once in control of the Polish administration, the Prussians started germanising names. Kreft, with no obviously Polish ‘ski’ suffix, or consonant combinations, did not need attention. Johann is a germanised derivative of Jan or Janusz. (King Jan III Sobieski led Polish and German troops to victory at the Battle of Vienna in 1683.) During the Prussian partitioning of Poland, Latin priests recorded the name as “Johannes” while German priests and officials registered “Johann.” According to Kaszubian historian Stanisław Frymark,1 the spelling “Jan” returned only after Poland regained its sovereignty in 1918. Whether Johann Kreft’s lineage originated in Germany we may never know but to the Prussian authorities he was a Polish Catholic and treated as such. Johann Martin Kreft did not revert to a Polish spelling of his name once he left his homeland but prudently became John in New Zealand. On the lammershagen passenger list, he was the mysterious JM Krept and on the earliest New Zealand lists bearing his name, he is John Krefft or Krepts. After a few more early mis-spellings, such as Rrept and Kraft, his surname stood unchanged. Thomas John Kreft, born in Dunedin in 2007, is the son of John Patrick Kreft, who is the son of Anthony John Kreft (Tony), who is the son of John Patrick Kreft (Jack), who was the son of Martin Kreft, who was the son of Johann Martin Kreft (John), the one who came to New Zealand in 1875 and who was the son of Johann and Barbara Kreft. Johann Martin Kreft’s reasons for leaving his homeland would have been similar to those of other disenfranchised Kaszubian and Kocievian Poles, serfs who earned their living as farm labourers. (See polish anchors 1872–1876.) Birth, death and marriage records show that they moved regularly, suggesting precarious lives, no permanent homes and that they followed available work. Children were born in different villages and many died, like Johann Martin and Rosalia’s first son, Franz, who was born and died in Szczerbięcin in 1869. Johann was born in the same village a year later but Joseph was born in nearby Stanisławie in 1873. 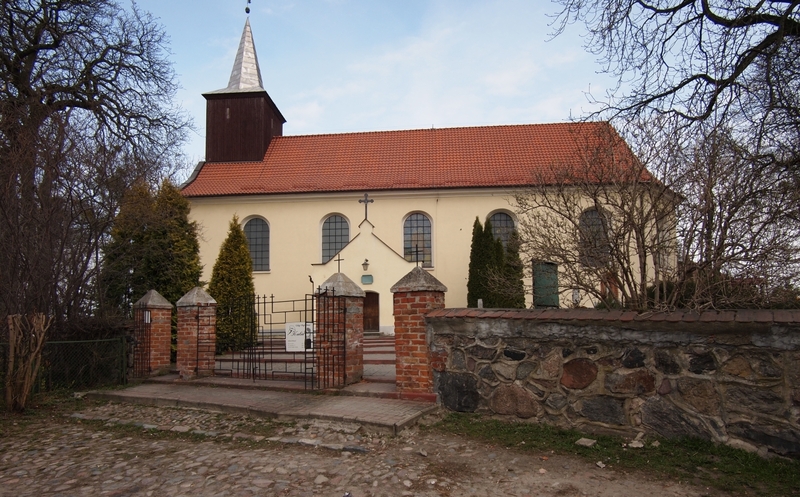 Like many Polish Catholics in the area, Johann Martin and Rosalia travelled to the St John of Nepomuk church (kościół św Jana Nepomucena) in Godziszewo to marry. According to family stories, the Krefts left Stanisławie with the Czeblewski, Kruger, Max and Rosanowski families. It is not clear whether those families managed to pay for their own travelling expenses, were particularly close, or whether they benefited from schemes where villagers paid into a travel fund. Once there was enough money, names were drawn and the winners used their takings to pay for transport costs. By 1875, the colonial government had started to curtail assisted immigration from continental Europe. Administrators of the scheme had not only underestimated the costs involved but had also not taken into account the problem of an initial language barrier, or that some immigrants had families. Private employers became reluctant to absorb them. The lammershagen arrived in New Zealand at a time when the colonial government had introduced “Special Settlements” in the most remote areas of an already sparsely populated country. By channelling awkward non-British immigrants towards these remote areas, the government freed up precious immigration barrack space and the cost of rations. When they arrived in Wellington, Johann and Rosalia Kreft, keen to join their families in Waihola, believed assurances that Jackson’s Bay on the west coast of the South Island was near Waihola on the east coast. With 13 other Polish families off the lammershagen5 they left by sea for Hokitika, then waited for the local vessel waitara to take them the final 250 kilometres south. They disembarked on the stony beach at Jackson’s Bay on 15 August 1875. As tough as life had been under Prussian oppression in their homeland, there remained an established semblance of shelter and the ability to acquire food. As long as one could walk across the flat land to a friend or relative, one could share their vegetable gardens or milk from thier cows. John Kreft’s stoicism did not extend to wasting time in a dire situation when another, with extended family, beckoned. By December 1875, his was the first Polish family to leave that miserable place. In the three months his family lived at Jackson’s Bay, John Kreft earned a total of ₤16 8s. His account at the general store had already run up to ₤16 14s 7d, which he paid before leaving. John and Rosalia probably travelled by sea to Dunedin and took the train south to Waihola, along the new railway that the 1872 palmerston Poles had helped build through the Taieri plain. After Mary came Rosalia (born 1879), Albert (born 1881) and Thomas’s great-great-grandfather Martin Kreft, John and Rosalia’s seventh child and the last born in Waihola, on 14 May 1884. John Kreft, like so many of the other early Polish and European settlers, showed up the prejudice of some colonial officials and employers for what it was. The Poles may not have been able to speak English when they arrived in New Zealand, but soon overcame that barrier. By the time Martin’s younger sisters, Barbara and Catherine, were born in neighbouring Akatore in 1887 and 1889, their father had bought about 250 acres there. John Martin’s very Polish wife, Rosalia, lost none of his sheep when she took over the running of the farm. “Mrs” Kreft replaced John as a sheep owner in the 1901 returns. Rosalia appeared on the first 1893 Electoral Roll for Women, as did her sister-in-law “Rosalie” Kreft. Rosalia Kreft, pictured right, died on 31 July 1911, aged 63. She was buried with her husband in the Fairfax cemetery, Milton. 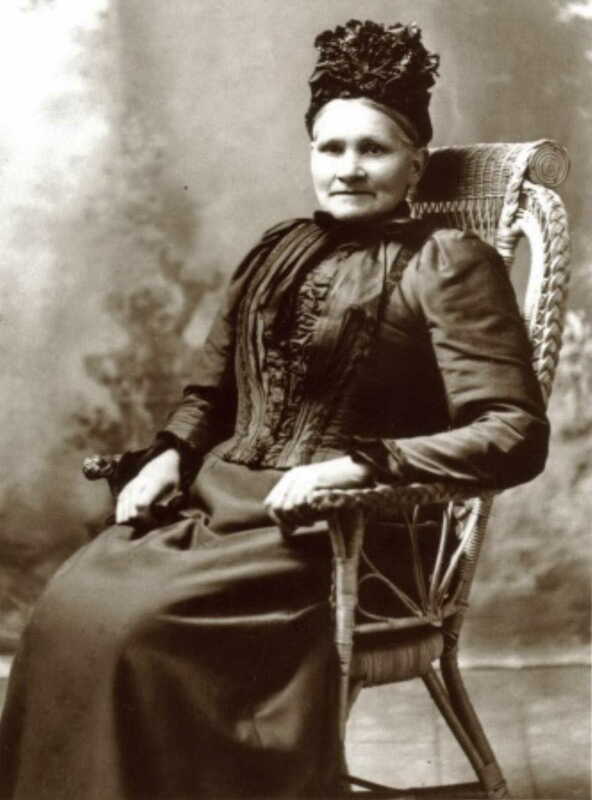 Her son Martin’s future wife, Ellen (Nellie) Maley, was born in Milton in 1882. Nellie’s parents, Patrick and Mary, née Killilea, married in Milton in 1874 but were both from Galway, Ireland. Martin bought his mother’s Moore Street, Milton, home through auction soon after she died. It coincided with the birth of his second child, Mary Frances, a sister to John Patrick. A few months earlier, he had put a house up for sale or rent in Burns Street, so he and Nellie may have moved in with Rosalia during the last months of her life. Mr Kreft led his bride, charmingly dressed in a dark blue costume, from the chapel, and the party and their numerous friends were soon whirling along in carriages to Clarksville, where [the widowed] Mrs Maley had a sumptuous breakfast prepared. … a drive to Clarendon, many vehicles being requisitioned, was the next feature. As amicable as he seemed, Martin Kreft stood up for himself when, as an owner of six acres in Springfield Road in 1917, he felt its valuation had been set unfairly high. The Assessment Court reduced it. A year later he petitioned, with more than 200 other property owners within the Tokomairiro river’s flood zone, to place their land under the protection of the River Board. Apart from his brother Joseph there were no other Polish names. Martin’s eldest brother, John, who was born in Szczerbięcin in 1870, died at Martin’s Springfield home in 1925. That John Kreft never married. Martin died in December 1950 and Nellie in March 1952. Like John and Rosalia, they are buried at the Fairfax cemetery. 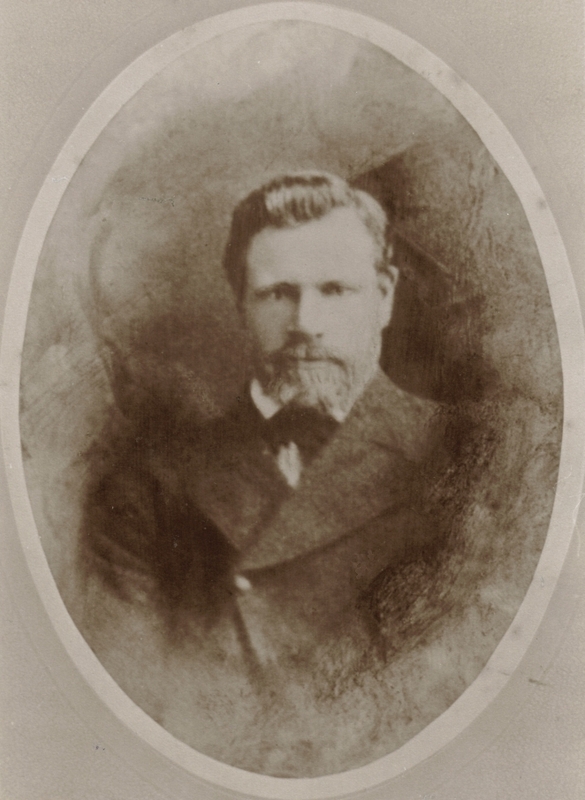 Martin and Nellie’s oldest child, John Patrick, became known as Jack. He married Sibbley Winifred Little in 1944. Electoral rolls show they lived in Milburn, Bromwell and Lowburn before moving to Ranfurly in about 1955. The first of their six children, Anthony John (Tony), was born in Milton on 27 March 1945. Tony married Ethel McDonald in 1969. They had three sons, another John Patrick, Grant Anthony and Martin Alan. 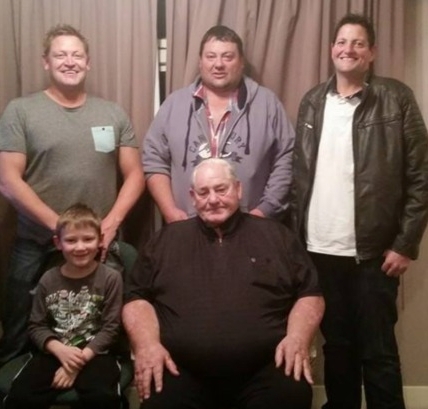 Thomas with his grandfather Tony Kreft in the front and behind, his father, John, flanked by his uncles Grant, left, and Martin. Tony continued to play and coach rugby for Ranfurly and instilled the love of the game into his grandson Thomas. Thomas’s father, John Patrick Kreft, trained as a butcher and works as a technical field representative for a national farming supply company. Thomas will no doubt enjoy the best of his father’s love of hunting and fishing and his grandfather’s rugby, which he already plays at school. Rugby reigned in 2016, when Thomas was chosen among others to run onto the pitch at the Forsyth Barr Stadium in Dunedin with Highlanders forward Dan Pryor. 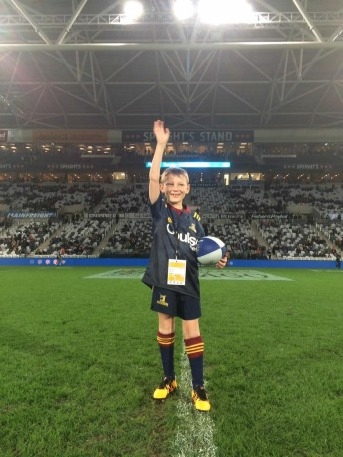 And when Thomas took the ball onto the field for the Highlanders-Crusaders game that May, there could not have been a brighter smile or a prouder child. ALL FAMILY PHOTOGRAPHS FROM THE KREFT COLLECTION. THE FIRST PHOTOGRAPH OF THOMAS WAS TAKEN IN AUGUST 2018 WHEN HE WON A “MOST VALUABLE PLAYER” AWARD. 1 - Stanisław Frymark can be contacted through our get in touch page. 4 - Appendix to the Journals of the House of Representatives (AJHR), 1877, D-01, IMMIGRATION TO NEW ZEALAND (LETTERS TO THE AGENT-GENERAL), page 8. 6 - AJHR, 1891 Session II, H-15a, THE ANNUAL SHEEP RETURNS FOR THE YEAR ENDED 30th APRIL, 1891, page 82. 7 - AJHR, 1901 Session I, H-23, THE ANNUAL SHEEP RETURNS FOR THE YEAR ENDED 30th APRIL, 1901, pages 116-118. Names in the returns probably incorrectly spelt. 8 - Ibid, pages 10 & 136. 16 - Bruce Herald, 10 October 1907, page 4, The Bruce Herald MILTON THURSDAY, OCT 10, 1907. 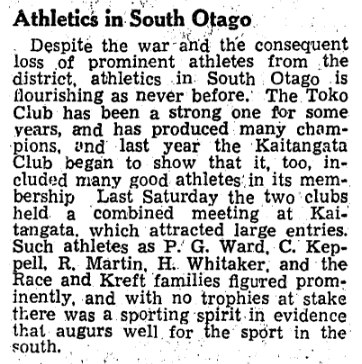 20 - Compiled by RH Chester & NAC McMillan, The Encyclopedia of New Zealand Rugby, 1981 edition, page 113, MOA Publications Ltd, Auckland.